Now that the end of the month and the quarter is fast approaching, I’ve decided to close my forex positions on EUR/NZD, AUD/CAD, and USD/CAD. Here’s my review for these setups. So much for a position trade! I thought that this would pair would keep heading lower after finding resistance at parity nearly a couple of months back, but it simply stayed stuck in consolidation. Both the RBA and the BOC cut interest rates around that time, so I’m not surprised that this pair just drifted sideways. I’m just bummed that I added another short position at .9600 and ended up giving up my profits on my initial short position at .9900. I was able to exit this forex trade early at .9750, right around the bounce off the triangle support and before the upside break, so I was breakeven on this one. 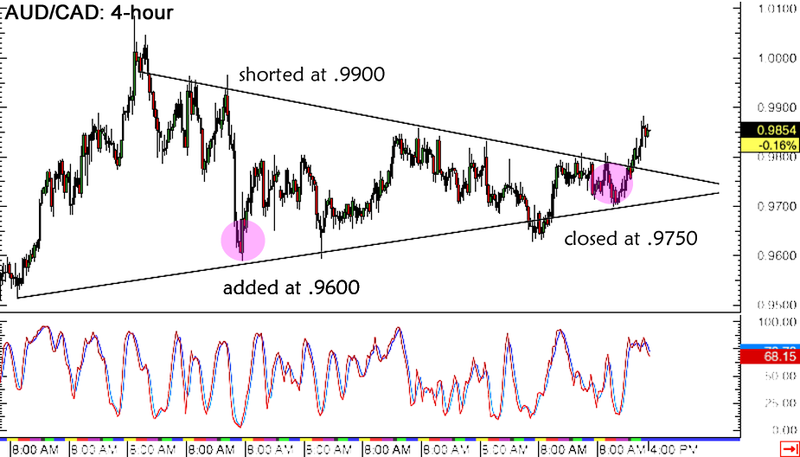 Here’s another excellent forex setup… that I didn’t execute so well. I was able to go long USD/CAD on an upside break of the descending triangle on the 4-hour time frame then I moved my stop to entry prior to the FOMC statement, which wound up erasing all my gains. In retrospect, I know that I should’ve locked in a few pips (maybe closed half of my position?) before the top-tier event when USD/CAD had been trading at 1.2800. I guess I was really counting on hawkish remarks to push price past the 1.2900 point at which I planned on adding to my position, but we all know that’s not how Yellen rolled that day. 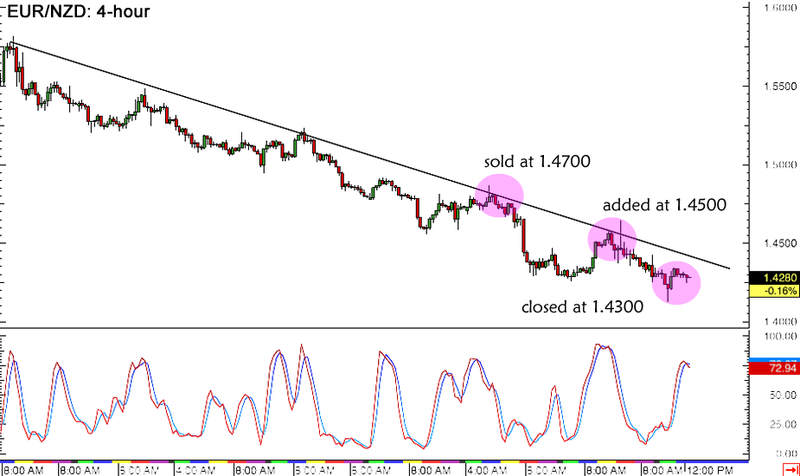 Now this forex trend play fared loads better, as the downtrend carried on for weeks and allowed me to press my advantage. I was able to enter a short position at 1.4700, with an initial stop at 1.4900, then I added on another trend line pullback to 1.4500 and adjusted my stop to 1.4700. I eventually closed at the 1.4300 major psychological support for a 3:1 reward-to-risk, woohoo! 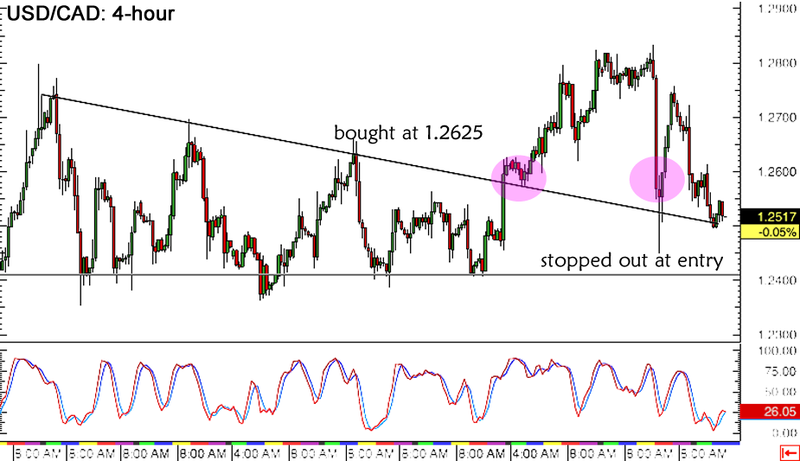 All in all, I’ve ended with one big winner out of three forex trade ideas while the other two were breakeven trades. With better risk management, I could’ve ended up with a few more pips in my bag instead of giving up those could’ve-been gains. For now, I’ll be content with the lessons I’ve learned and I’ll be sure to apply these in my next forex trades. Do stay tuned for my quarterly trading performance update next week!